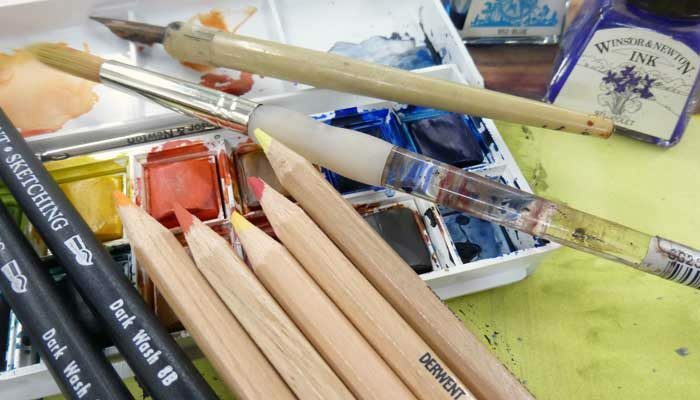 This course introducing you to using water-soluble drawing materials offer students the opportunity to discover the excitement of working at the cross roads of drawing and painting. Discovery and unpredictability are often part and parcel of these water-soluble art materials, although learning and practicing technique will give you greater control and precision. Perfect for all students who wish to learn about the joys of working with water-soluble graphite, colour pencils, pen and water colour wash, and enjoy the playfulness of drawing inks. to see what you need to bring. During the morning students will learn about water-soluble graphite through demonstrations and exercises. This will be followed by a creative project designed to give students the opportunity to experiment and discover the full potential of the graphite and develop their skills in developing tone and shading. Students will be supported with lots of 1:1 tuition as well as group critiques. The afternoon session will give students the opportunity to move into colour by being introduced to water-soluble colour pencils. Students will be given a demonstration and work through exercises to learn the basics and then move on to a creative project to allow them time to fully explore the potential of colour pencils. Day 2 involves drawing with more fluid mediums and begins with a demonstration of how to draw with pen + wash. After a short exercise students will complete another creative project allowing them time to experiment and explore with 1:1 support and guidance. In the afternoon students will be shown how to use drawing inks with dip pen, brush, and more creative drawing tools, in order to fully understand the potential of drawing inks. This is a great course for beginners as all techniques I teach will be fully demonstrated and students will receive lots of 1:1 tuition. 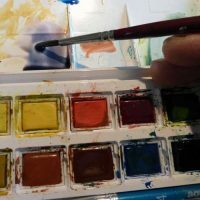 Improvers and intermediate artists will also benefit if they are looking to branch out into using materials they have not yet fully understood. Course includes tea, coffee & biscuits. Please provide your own lunch on full day courses,workshops and classes. Brian has a background as a fine artist, community artist and adult tutor. Brian is passionate about teaching and enthuses his students with excitement for creativity and making art. His teaching style is supportive, relaxed and friendly, yet focused on ensuring everyone is able to progress to their potential. He is Lead tutor at Creative Art Courses. No spam. Unsubscribe when you wish. Courses are grouped into 4 strands, each with a different focus. Create your own patchwork of courses depending on your interest and availability. There is no specific starting point. Essential skills for the absolute beginner. The engine room of creativity. Create sketchbooks that inspire greater creativity. Expand your mark-making skills to create more expressive drawing + painting. Essential introduction to colour mixing, colour relationships + colour as composition. Line, tone, colour, shape, etc. Insights into the essential tools for making art. Learn foundation drawing techniques to develop a new clarity of artistic vision. Teachings from Heather Spears book The Creative Eye. Learn from Cezanne, Matisse + Picasso to create your own personal drawings + paintings. Introductory course for developing drawing and creative skills. Introductory course for developing acrylic painting skills. 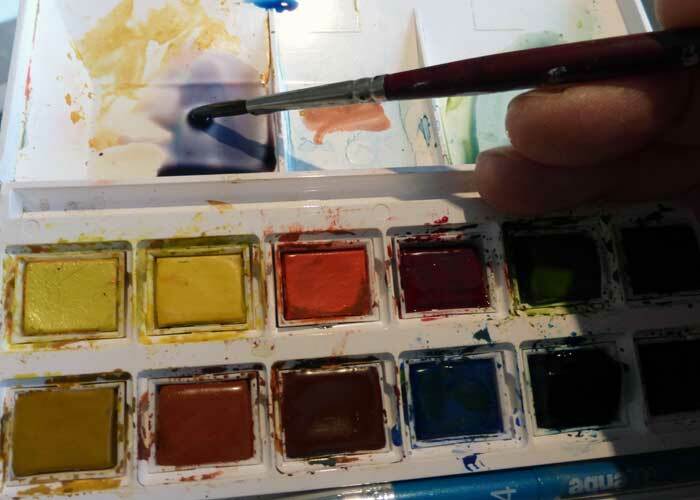 Introductory course for developing water colour painting skills. Introductory course to learn to draw with pen + wash, soluble graphite, soluble colour pencils and ink. Introductory course to learn to draw with willow and compressed charcoal, graphite sticks and pencil. Introductory course to learn how to draw with soft chalk pastels and oil pastels. Stand out – learn to develop a strong artistic voice. A new way of looking and expressing yourself – be in control. Introduction to the underlying principles of abstraction, along with creative techniques. Learn urban sketching fundamentals along with creative techniques to use in the field. Intensive 4-day life drawing course for beginners to intermediate. Introducing you to the insights and techniques from Heather Spears’ book The Creative Eye. Re-imagine the landscape as colour, shape, form, texture, and explore your imagination. Delve the figure to unlock its unifying forms, colours, and textures to express universal human emotions. Community group for all of Greater Manchester’s residents interested in peer-led creative projects and supportive friendship. Peer-led life drawing group for all abilities. Probably the most friendly Tuesday evening group in Manchester!